Scholastic magic was a product of the medieval university: incomprehensible mutterings, alchemic potions… and reading. Teaching Magic: The 8th century Irish Book of Kells, one of the finest examples of medieval book illumination. Modern education starts somewhere in the 11th century – so long ago, no one is even sure of the exact year – at the University of Bologna. The universities were an outgrowth of the medieval cathedral schools, which trained young boys to be priests and to fill other clerical duties. That is an important insight: clerk, cleric, and clergy are all related words, and all originated from the same educational traditions. The great research tool of the medieval university was the book. Buying a book today for a few dollars, or even reading a free book on-line, would have been incomprehensible to the medieval scholar. All books at the time were handwritten and handmade, often gorgeously lettered on vellum, a durable writing surface made from calf skin.1)‘Vellum’ is related to the word ‘veal.’ The preparation of the vellum, the laying out of the book, the tedious but exacting copying of the words and letters, and the adding of painted colors, gilt, and other illuminations, was slow work; it might take a monk two years to make a book. A Bible could easily require decades, even a career. Now the clergy weren’t rocket scientists by any means, but they were the closest thing available in that day. They were the best-trained intellectuals and the brightest minds the medieval world offered. As monastics, of course, their payment consisted of nothing more than food, a few pieces of clothing, and a tiny chamber with a hard, cold bed. But for the sake of comparison, let us say their time was as valuable as that of an engineer today. The average annual salary for a modern civil engineer is $90K. So for an idea of the two years of labor to make a book, think $180K. But then remember that, like any well-run business, the monastery had overhead and needed to generate some excess above that price, to cover buildings, fuel, administration, care for sick and elderly members, et al. Looked at in that way, by today’s standards a modest book might be worth a half million dollars. But that was a typical book; a Bible would cost many times that. You can begin to understand why cathedrals and monasteries carefully guarded and protected books, which might be encased in metal and chained down. It also explains why Bibles were often adorned with silver or gold, and encrusted with precious jewels. In the lecture, students wrote down what they heard, and then turned the notes into their own cheap, abbreviated versions of the book. With time, university towns generated entire industries focusing on transcribing lectures, rewriting them, even binding them for the students. University students came from all over Europe, perhaps even further, and spoke many, many more languages than exist today. Each region had, at the very least, a distinct dialect of the dominant language of the larger country, and some regions had completely different, unrelated languages (we still cannot identify the origins of modern Basque and Finnish). So they needed a universal language was necessary. Hellenized Roman Jews led the early church after Titus destroyed Jerusalem, so the primary Medieval language was Latin, and the secondary language was Greek. Like all medical students, I struggled to master an enormous, vocabulary based on obscure Latin and ancient Greek. The irony is that early anatomists actually gave anatomical features and diseases the most obvious names they could think of. It’s just that they thought in Latin and Greek.2)I took Latin in high school, and picked up the rudiments of Greek letters and words along the way; with a great reference on scientific roots, I estimate that I was able to memorize medical terms in less than half the time as most of my classmates. All of this may seem tame, even boring to the modern reader. Nevertheless, it was the rocket science of its day. Or more than that: to the illiterate commoner it was all incomprehensible. The universities were places of scholastic magic. To look at a piece of paper and know what the king had said, what the outcome of a battle was, what happened long ago – or, most impressive of all, to know what God said and meant – was scholastic magic. Consider that our tropes about magicians such as Merlin, Gandalf, and even Harry Potter come from the university lecturer. He was teaching magic. The academic wore a long-sleeved academic gown and a pointed hat. He carried a wand, for pointing to words in a book or formulas on a slate, or for directing musicians (hence the conductor’s baton). He muttered magical phrases in obscure Latin, Greek, and Hebrew. The incomprehensible Latin prayers and incantations from books gives us the phrase, ‘to cast a spell’. Scholars suspect that both ‘hocus pocus’ and ‘abracadabra’ originated in the scholastic medieval languages. And the academic used cabalistic symbols. These overlapped between astrology and alchemy, describing the stars that govern our fates, and magical esoteric mixtures. And medieval scholastics added greatly to the appearance of scholastic magic by publishing curses for those who didn’t return books. These concepts and approaches of scholastic magic dominated the medieval university. As we shall see in upcoming posts, they still heavily influence our modern concepts of education. Continue reading: Rote/Wrote, Memorization vs Education. 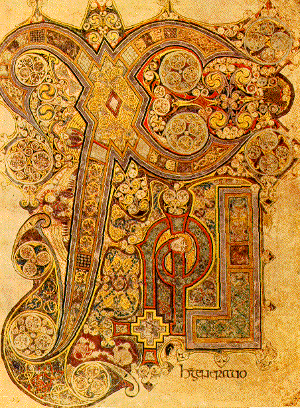 Picture of ‘Chi Rho’ from The Book of Kells courtesy of Wikicommons.org. 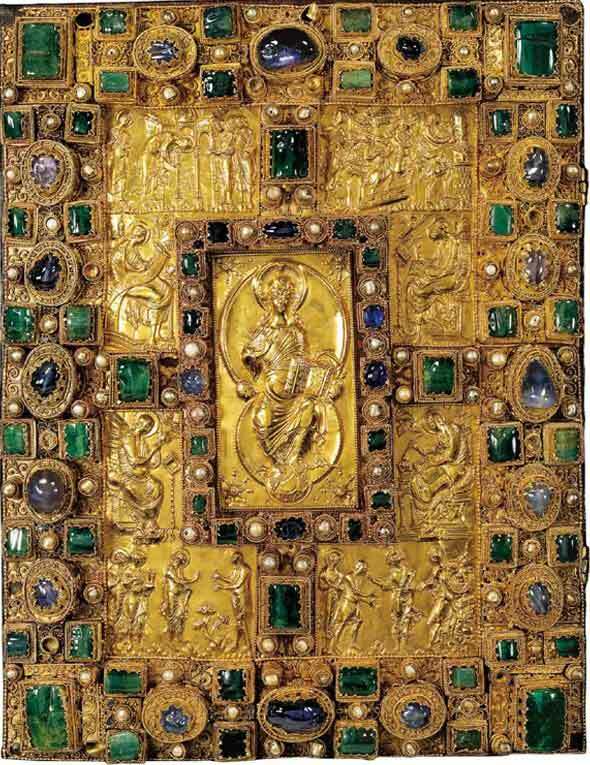 Picture of the Codex Aureus of St. Emmeram also courtesy of Wikicommons.org. 2. 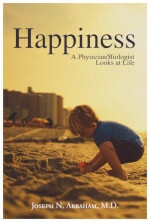 ↑ I took Latin in high school, and picked up the rudiments of Greek letters and words along the way; with a great reference on scientific roots, I estimate that I was able to memorize medical terms in less than half the time as most of my classmates. Bologna was the premier university of its day. FWIW, if I have not suggested it to you already you might want to read Greenblatt’s The Swerve, telling the story of one Poggio Bracciolini, who found one of the most controversial manuscripts of the day, Lucretius’s De Rerum Naturae, explaining Epicureanism. Bracciolini learned Greek under Manuel Chrysolaris, and then rose swiftly in the Papal bureaucracy to become apostolic secretary to several popes. One of them was Baldassare Cossa. In fact, after Cossa was deposed as pope, Bracciolini set out across Europe looking for texts, and that was when he found Lucretius’s book. BTW, we still don’t know exactly where he found it. Years ago I focused on how my job as a yearbook consultant/teacher presented a situation for kids not only learning the subject matter but also producing the product—–This was actually moving the bar from the cognitive to the effective level of learning—To think that the word EDUCATION comes from the Latin educo meaning to lead or draw out, I always wondered about the differentiation of the 2 and the chronology of the 2—–In Erath that meant to learn the “boat of dem”—–the basics, the transitioning to a higher level, the learned/use of the higher level, and then the creation of a higher level!!! Just seems logical to me!!! Good observation. In my post on Non-Learners, I point out that all children are curious. So to my mind the operative question is, does a strong knowledge base lead to curiosity and analysis? Or do curiosity and analysis lead to a strong knowledge base? My thoughts would be of not limiting to an either or—-Case in Point would be say my music—I was curious about how to play a one note at the time song (did it on my own)—This knowledge peaked my curiosity/desire to play a 3 note chord—and yes the cycle kept repeating itself—It was like stacking a pile of books–one came from the curiosity side and then the knowledge side as the stack became larger which would represent knowledge of the subject matter—but Doc another phenomenon is the phase out stage where the curiosity or desire leaves for some—Why??? I know you have had to experience this for yourself or seen it in others of all age groups in a vast number of areas!!! Keep up the great work!! !